Mariann has been involved with animals in one form or another all her life. She was a wildlife biologist for 35 years and now has shifted to try to help small and large domestic animals. 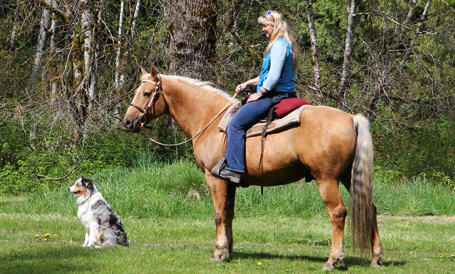 She has been a breeder of Morgan Horses for over 35 years and has bred Australian Shepherd dogs for over 20 years. She prefers to compete with her dogs in agility when she can fit it in. Otherwise they go with her where ever she goes. She and her family are partnered with several dogs, cats, horses and an African Grey Parrot. Mariann has been involved with TCM for 5 + years through Tai Chi and Qigong and practices a whole health approach looking at all aspects of an animal’s health when assessing the situation. She offers a holistic approach to animal care and is interested in bringing awareness of alternative medicine to pet owners as a compliment to vet care. She uses a variety of modalities including acupressure, essential oils, energy balancing, animal communication, and photonic torch. Mariann is certified through the Tallgrass Animal Acupressure Institute as an Acupressure Practitioner for Equines, Canines and Felines, in Food Therapy and in Equine Essential Oil Therapy. She is certified through the Animal Spirit Network in Animal Communication, and is exploring Energy Healing for Animals through the Dragon Rising Institute. She has also been Nationally Certified by the National Board of Certified Animal Acupressure and Massage Practitioners (NBCAAM) for Equine and Canine/Feline Acupressure. She will do on site appointments at the animals’ home where they are most comfortable and services Whatcom, Skagit and San Juan Counties.